When clients engage Select Resumes, we send out a form for them to fill in which includes short- and long-term objectives. This helps us better understand your overarching aims and allows us to couch our questions to you in the consultation within the parameters of those objectives. Whilst there is some debate amongst resume professionals and employers about whether there should or should not be a career objective at all in favour of just a profile, we at Select Resumes, believe that a resume objective is a positive, clear statement of intent. Our rationale is that it is much easier for a prospective employer to find that statement in a short, well-written paragraph than to attempt to piece it together from a list of professional experience and education in your profile. A persuasive objective that is tailored to the role you are targeting will encourage the recruiter to read more of your resume. However, when it comes to the resume and cover letter, how – and where – your career summary objectives appear and how they align with your prospective employer’s objectives (which are a large part of what they want to see), is a crucial balancing act you must master. The wording of your objective should focus outward, showing recruiters what they stand to gain by hiring you – not what you want by working for them. Another factor regarding the objective is how much information to put in – how specific should you be? 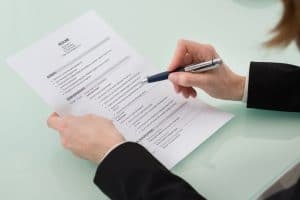 If your resume is not for a particular role, sometimes being too explicit with a career goal can put employers off as they may not ultimately think they can accommodate you. You may have very firm ideas about your ultimate objective, but you do not want to pigeon-hole yourself. Try and keep your options open whilst still implying that your ultimate goal is to become, for example, “a Registered Nurse specialising in midwifery”. You can do this by saying that you wish to consolidate your skills by looking for “further valuable experience and responsibility in a nursing role where my capabilities and skills can be utilised to maximise patient care and with the aim of eventually emerging as a Registered Nurse in a midwifery setting.” In this way, you are remaining employer-focused whilst still iterating your eventual objectives. The summary likewise should be a well-worded rundown of your qualification and key positions to date but always with a through-line purpose of illustrating to your future employer what benefit you will be to them. It is key to write your resume with an eye to reading it back through your recruiter’s eye. They are looking for what will benefit them, not you. It is a given your skills and experience will match their criteria – but what will separate you from the crowd is your written ability also to reflect your capacity to be a tangible asset to the company you are applying to. At Select Resumes, we have perfected the art of being able to showcase our clients whilst at the same time presenting them as outwardly focused individuals whose talents will maximise productivity and efficiency for the readers’ company. This is in many ways the key to a successful application and why we are so successful at helping clients reach the all-important interview stage. Contact us today for an informal chat to see how we can create for you the perfect resume.